Place chicken wings and water in a roasted pan covered in a 350 degree oven for 40 minutes uncovered about 15 minute until golden. You need a cup of plain flour a cup of cooking oil to make a light brown Roux for the gravy..
Add roux mixture with onions and celery and cook until thicken.. 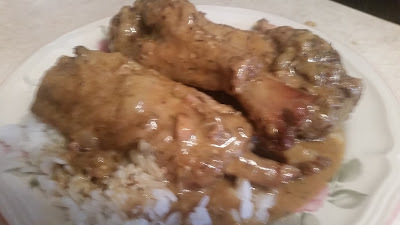 Plate your roasted chicken wings and rice and pour gravy over the chicken wings..